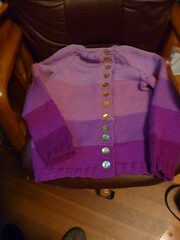 It was Margaret’s turn for a sweater, and I decided to go with the Tiny Tea Leaves Cardigan pattern. It’s the kid version of an adult pattern of the same name, minus the “tiny”, The yoke was a little tedious with all the increases and decreases, but the result was well worth it. Now I need one for myself. I think that this is my new favorite of the sweaters I’ve made for Margaret. I know I mentioned this last time because I started it in October. To recap, after making a sweater from a kit I had enough purple in 5 shades leftover for a second sweater. This is old, “undeclared” stash. 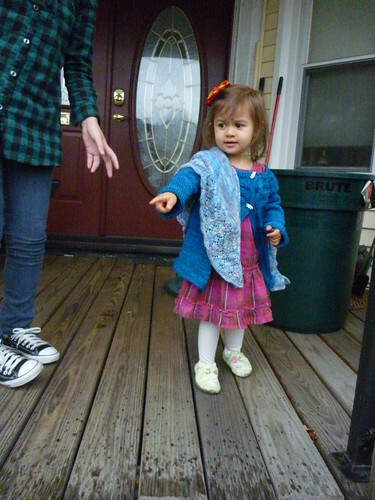 This is now finally a sweater for Hongmei, and I am less worried about my au pair freezing to death. She seems duly appreciative. Knitting an entire sweater from undeclared stash was a bit of a downer. I’ve come to really like the boost I get from seeing the numbers on my stash-tracking spreadsheet change. Luckily that was the biggest chunk of undeclared stash there was. Now the next biggest chunk is two hanks of sage silky-wool, at just under 400 yards and much more compact. It’s a problem that will solve itself soon enough. Both are very nice. :-) I like the way the purples go together. Do you know what Hongmei's favorite color is?